Kellen Gulley of 111 Cardinal Lane in Clinton and a former player for the Chicago Fire of MLS, is believed to be a significant dealer of marijuana, powder cocaine, and codeine syrup in Clinton and other portions of the metro area. Of interest to CPD narcotics Detectives is Gulley's connections to the youth of central Mississippi. On July 29, 2016, at approximately 11:00 pm, a CPD Narcotics Detective made a traffic stop on a black Cadillac CTS being driven by Kellen Gulley. 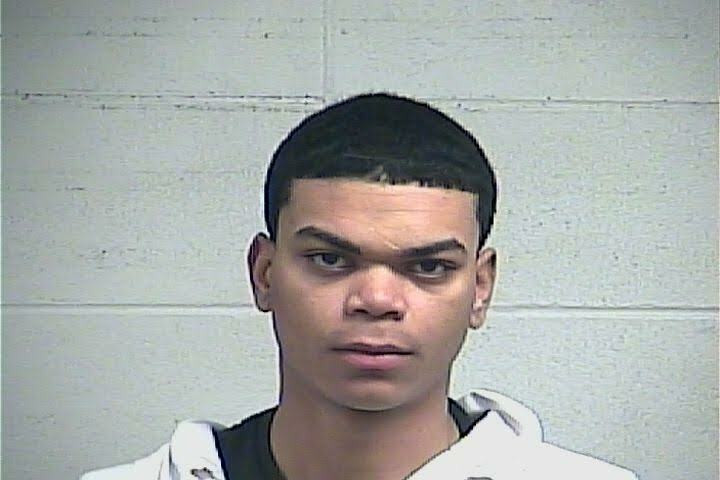 When the detective smelled the odor of Marijuana emanating from within Gulley's vehicle, a search ensued. During an inventory of Gulley's vehicle, the detective recovered various illegal drugs packaged for sales along with weight scales, a semi-automatic handgun, and suspected drug money. Based on prior encounters and the evidence found to be in Gulley's possession, the detective obtained a search warrant for Gulley's residence at 111 Cardinal Lane in Clinton, Mississippi. The search of Gulley's residence yielded additional illegal drugs, paraphernalia, and suspected drug money concealed in a bedroom. Kellen Gulley is no stranger to the Clinton Police Department's Narcotics unit. Gulley was currently out on bond from the county jail on charges related to aggravated assault, shooting into an occupied dwelling, felony possession of a Marijuana with the intent to distribute while in possession of a firearm, felony possession of a schedule V controlled substance while in possession of a firearm, misdemeanor possession of a schedule II controlled substance, and possession of paraphernalia. On January 25, 2016, Kellen Gulley was arrested in relation to a shooting incident that occurred at his residence located at 111 Cardinal Lane in Clinton, Mississippi. The January shooting stemmed from a "drug deal gone bad" where Gulley was believed to have opened fire, hitting a subject who was attempting to rob Gulley for illegal drugs. The January search of Gulley's residence yielded large amounts of various illegal drugs, a semi-automatic assault rifle, a semi-automatic handgun, paraphernalia, and suspected drug money. Time to legalize it already. Otherwise you are just letting criminal elements like this run the market and terrorize communities. Why was this creature not held on no bond? What judge granted this ridiculously low bond? Is Ivon involved? That's right. If we would just legalize weed all the drug related crime problems will magically go away. Arrest the dad....you know the one that got suspended from attending soccer games for rushing the field and chest bumping a ref? This has been brewing a long time. @3:09. Hell of a good idea. Let's legalize everything - then we won't need jails. It would completely eliminate criminal elements like this because nothing would be criminal. Only thing is - they would still terrorize communities. This is very sad, an example of a kid with so much promise who somehow went off the rails, and has now decided that being a low level drug dealer is the only way to make a buck to pay for a $50,000 car. This idiot commits a dozen new crimes while on bail for previous crimes, including shooting at someone. And gets another low bail. And you guys say Jackson is the problem? @5:11 You are more myopic than you probably realize and/or have the ability to fathom. Justice system is the #1 problem. Not the only problem, but #1. Colorado did it and it's actually working rather well. Who is myopic now? We don't have to guess at the results any longer. 8:37 - Are you unaware of Colorado's escalation in the incidence of traffic accidents and crime in the wake of MJ legalization? Attn 6:27 I am unaware of the escalation of accidents in Colorado after weed approval. Please elaborate and provide a means of verification of your statement. People are only aware of what they want to see in the Colorado mess. Neither side looks at the whole picture. Much like anything else. If they do not admit knowing it they think other people should do the same. "Attn 6:27 I am unaware of the escalation of accidents in Colorado after weed approval. Please elaborate and provide a means of verification of your statement." Google is your friend, lazy boy. You say it's a mess, which is absurd. Go to Colorado and see for yourself. It's a perfectly happy place, welcoming of the booming new industry. Even the governor agrees. And there is no sign of the Apocalypse out there, feels quite safe and normal in fact. Since we've tried the drug war for years with nothing good to show, this approach makes much more sense for the overall good. And it's working. @10:43 the majority of Colorado outside of the urban areas like Denver and most of the resort towns despise the legislation and what all it has brought in. The liberal media doesn't report on that side so it will paint a prettier picture, but the most everyone outside of isolated areas full of pot heads hate it. This is coming from someone who is real familiar with Colorado. A perfectly happy place, only if a person thinks increased crime, more children harmed, increased number of car accidents, makes for a happy place. I can understand it from a druggies view just not from the view of a person who does not need a crutch to handle life. I live in Colorado as we speak. I am a native of Mississippi and lived there for 25 years. I moved here after I graduated in 2012 for the beauty and opportunity I saw in the state. Upon my arrival I learned that the recreational use of marijuana was being legalized for 21 and up. That's a plus I thought (I know how dare I say such a thing!) I have earned a bachelor's and an associate's degree and yes, I partook in the smoking of MJ all those years! Scary, yes I know. Traffic accidents, ha. Drive drunk and you blow through the red light killing innocent people. Drive stoned and forget to go once the light is green. Shouldn't drive under the influence of anything regardless (yes that means hyrdocodone and xanax and Adderall etc etc etc etc etc etc etc etc for you rx'ers that are about to light me up for being an advocate for medical and recreational usage). Bombshell: I am moving back in August to your home state, MY HOME STATE. Please don't be too alarmed. I promise to: serve my community at my job to the best of my ability, take care of my ill mother, help prepare my parents to move and sell their house they built in Madison over 26 years ago, and to get two certifications I have been eyeing to get in my field of work. I have my own truck (yes rednecks and good ole boys partake), I have ZERO college debt, and have a full time job waiting for me. I hope I haven't scared anyone too much cause I'm not blowing smoke up yalls arses, anything in excess is not good be it alcohol or marijuana. One: Hopefully gulley learns from this, but, WTF, how was he not denied bail or bail set higher in the initial charge. Cracks in the MS judicial system are WIDE. It doesn't matter your race, its the size of that wallet, cash is king. Two: I was hit on my motorcycle in college. Broke many many bones. Got some screws in me, etc. Dr. prescribes me heavy pain meds and anxiety meds. I in turn have to watch for liver issues, constipation, withdrawals, etc etc etc. (This Dr. was later caught up in a doctor shopping ring which involved none other than current sheriff and former head of the narco unit in Oxford, MS). So I battle through this pill mess in college and find years and years later just some heavy CBD oil (do some research people, wow) relieves everything with ZERO side effects except for oops, I am a little hungry. Extreme danger. Caution. Check the side effects for all these pills people eat. I know from living in MS and being on both sides of the fence in the war on drugs! that if half of you go into your bedside drawer or "medecine cabinet" you not only have a narcotic pain reliever but probably sleeping meds and a nice variety of crazy meds (paxil, etc). Now if these work for you, good, bless you. I am not knocking anyone. You will never be the same again. Three: If I smoke (no smoke is good for you, MJ can be ingested many many ways, smoking being the most unhealthy obviously) then some of you may wonder...I must be some dread head feather wearing crystal rubbing jah loving debt ridden un-educated transient un-employed failure conspiracy theorist waste of space and most certainly a danger to Madison County (where I will reside). Fact: 29 year old white male with an athletic build, clean shaven face, and a high and tight hair cut who played college soccer until the motorcycle wreck ended my career. I'll be actively working out at a gym, road and mountain biking, and having a positive outlook on life because I'm blessed to have more time to spend with my ill mother. And no...I obviously don't plan on partaking in MJ once in MS. One, it is illegal and they lock you up longer than for homicide and some things much more serious. So watch out, a "stoner" is coming back to MS. Particularly the Madison/Jackson area(s). Look for the handsome well dressed athletic white male. I may even be your own son, grandson, nephew, cousin, uncle, or your dad. Do either of you mind answering, do you take prescription medecine? Do you drink alcohol? Do you/have you lived here in CO and what county were you in? Watch out I'm coming! I may have residual thc in my few fat cells! The liberal media, ha. The local and state news reports constantly on the crime be it a store robbery or a home invasion due to a grow operation. I can't spend my time on this blog "discussing". But I am heated to change my community in Jackson and surrounding areas. So I must comment and I will be quiet and read the ridiculousness that may follow. Harm to children...this is just awesome...do you know what alcohol or xanax does? No. You must not. Talk about aggression, memory loss, violent tendencies. Yes ok, you got it right, children are harmed. Parents most likely have MORE food in their pantries (ok half kidding) but check out what the tax from mj has done for say..public school lunches and breakfasts. Or don't because it's just too liberal. I don't have anymore time to rant but I want to so bad. Jobs, too much to say about the creation of jobs mj has brought to Colorado. I can't begin on the absolutely amazing public transit that sales tax goes to. Way too many positives to be answered by anymore "but crime, what about the kids! Or my favorite...traffic! People will wreck everywhere!" answers. If your going to post, make it a worthwhile read. Now, back to work, yes I have a job, wild huh! Damn "stoners" and their jobs. Finally. On everyone's way home I pose this question. With each car passing, each driver you stereotype differently, (I know this because of some people that frequent this website) which of them is "messed up on weed" and who is on narcotic painkillers, jacked up on speeds be it prescribed or illegal, or just plain had some beers or shots after work. Who would you rather drive by? I'm hoping for me. A realistic, considerate, confident stoner going to the gym or any outdoor activity I enjoy. Not to another bar. Not to my dealers house. And not to the pharmacy. I suspect all these old farts who support prohibition really just have a dislike of hippies/alt-culture more so than real concern about kids and traffic.... all while not giving two shits about deadly alcohol. 2:59, Maybe all of the old farts just have a thing about obeying the laws. Is that something the drug culture has ever given a thought about?